I want to send my PDF by email. But for my convenience, I am going to send email by matching up with the data in the CSV Spreadsheet. I read that your A-PDF Auto-mail has this function. Can you show me how to process? Is it very complex? 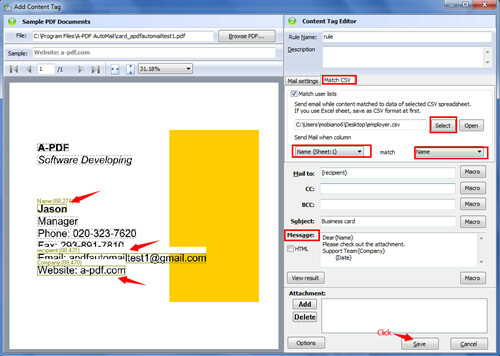 It is my honor to introduce you A-PDF AutoMail. A-PDF AutoMail is professional software designed to assist you in batch sending your PDF files automatically to the recipient email address which is in your PDF. And it allows you to send email by matching up with the data in the CSV spreadsheet. It is very easy to control. But at least you should have one CSV spreadsheet containing the content in your email. In this way, you can make use of it. Step 1: add your PDF documents. Make sure that it contains the email address. Step 2: add your new rule. 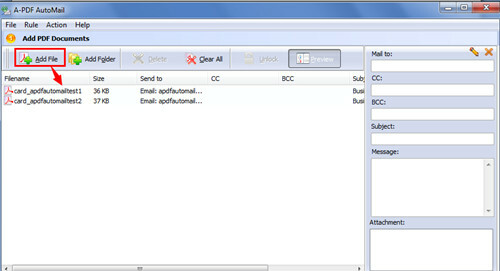 You are going to set the recipient of email, the Macro tag and the message sending to recipient. Also you can choose whether match CSV spreadsheet. Before emailing to recipients, you can select the email setting and send setting. And then save the change and click the button “Email” to send your PDF documents.